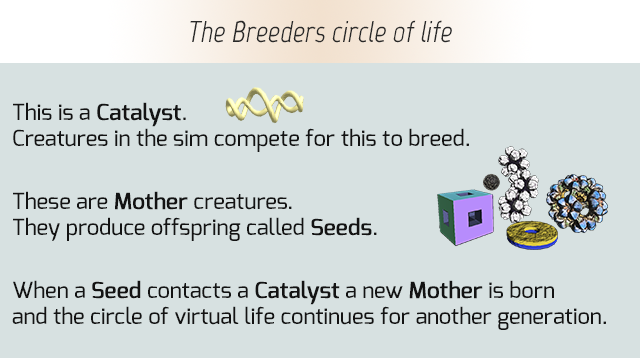 Breeders is a simulation of digital life driven by physics and simple rules. Breeders is an ecosystem filled with strange flora and fauna. It's a sandbox for exploring emergent behaviours and tinkering with complex systems created by simple rules. Every critter in the simulation has just one goal: breed. Each species tries to accomplish this goal in its own way but they all compete for the same vital resource - the Catalyst. Instead of muscles and bones the creatures roll, hop, and bounce using invisible bursts of force. Instead of eating they absorb energy from light. Instead of eyes and ears they have sensors to detect Catalyst and predators. Some creatures have no senses at all and must rely on random chance and physical reactions to survive. Sound strange? It is. Strange and wonderful. (^_^) Watching the simulation is like peeking into an alien world teeming with life. You can watch my series of Developer Diaries to learn more about the project. I released the first version of the sim in July of 2011. This was my very first Unity project so it was a little rough around the edges - but a great proof of concept. I was encouraged and a little overwhelmed by the response this received, especially after it showed up on the Gaming subReddit page. Thousands of people playing and hundreds of them offering advice and suggestions. My ideas for future versions of the game quickly grew beyond my skills so I took a break to gather my thoughts and build my code-fu. Play Breeders 1 - temporarily unavailable. After finishing the first version of Crashed Lander and a few smaller projects I returned to Breeders and set about creating a more complex version of the sim. I'd worked out a simple system of DNA that the critters could pass from generation to generation while introducing random variations, enabling natural selection. For now this project is on the back burner. Eventually I'd like to create a more refined version of the original sim - with better eye candy, a more dynamic environment, and a streamlined interface. A Survival Mode where the player will act as a critter in the simulation, fighting for resources and trying to breed new generations of their species. VR support, too.